Local Samaria leader responds to Lapid’s claims that ‘settlers’ take money from middle class. Earlier this week Yair Lapid, head of the new Yesh Atid party, launched an attack on “settlers” in Judea and Samaria who, he said, live at the expense of the middle class. “Are the billions of shekels that are spent on building roads in isolated settlements outside the settlement blocs not part of the problem? Is a reserve battalion guarding three families at an illegal outpost not a political exploitation of state resources... You turned the settlements in Judea and Samaria into another extortionate sector that takes the money from the middle class just because it can," Lapid wrote on Facebook, in an attack on Bayit Yehudi (Jewish Home) head Naftali Bennet. Lapid is mistaken in putting Judea and Samaria residents in a separate category from the rest of the middle class, argued Samaria Residents’ Committee head Benny Katzover. “The residents of Revava, Peduel or Itamar deserve investment in their infrastructure just as residents of Holon, Carmiel or Kibbutz Grofit do,” said Katzover, naming Samaria towns and towns elsewhere in Israel. “Do you disagree?” he asked Lapid. “And now I’ll put the ball back in your court with a question,” Katzover said. “What [expenses] would you cut? The roads? And how is the middle class supposed to get home? (By the way, the IDF and the Arabs who live near us use those same roads). The question of where in Judea and Samaria Israelis should be allowed to live – in “settlement blocs” only or in farther-flung communities as well – is a political question, Katzover said. “Until an answer is found, the government of Israel must give residents of communities in Judea and Samaria exactly what every other citizen of the country who fulfills their obligations receives,” he concluded. 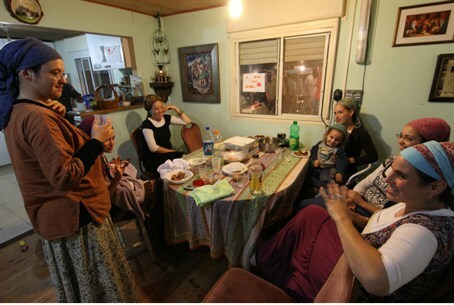 Yair Lapid toured Samaria one year ago with Katzover and other Samaria leaders, he added. “It’s a shame you forgot what I explained to you during the tour,” he said.